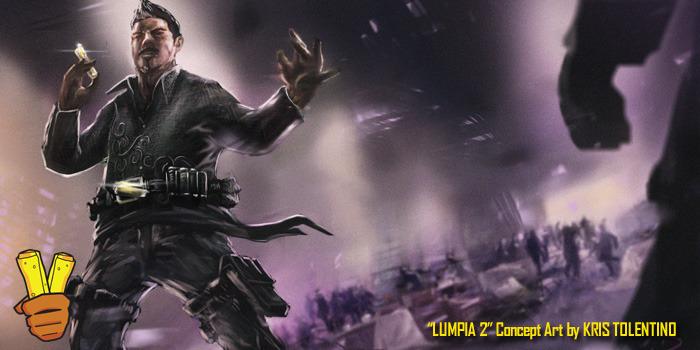 Why I ALSO Back Indie Kickstarter Campaigns: Agent Justin chimes in on the film: LUMPIA 2! Home /Announcements, Editorials, Movies, News, Opinion/Why I ALSO Back Indie Kickstarter Campaigns: Agent Justin chimes in on the film: LUMPIA 2! Kickstarter is an amazing thing. People with dream projects are finding out that other people can care about their work too. There are both a positive and negative things about Kickstarter. Recent projects like the Veronica Mars movie, the Zach Braff movie and the recent Mighty Number 9 video game Kickstarter from the creator of Mega Man show how hard the current climate is, even for established creators. Kickstarter is proving that there is a audience for the kind of work they want to do, despite what the executives think. And that’s great…but how about the folks that are ready for their debut? The creators ready for the world get to know them too? Folks like my friends filmmakers Patricio Ginelsa and A.J. Calomay. So how did I find out about the first film? Back in 2006, I first saw the trailer when I was looking up stuff on the film The Debut (the independent Filipino American film). I found out that one of the producers, Patricio, directed this low/no budget film…..
At the time, I was well into being an amateur filmmaker myself, trying to make short comedy sketches. I never would have though of making a full length movie, but here was a trailer (a well edited trailer might I add) that looked like it was made by a bunch of kids like me. Don’t get me wrong, it was rough, very rough, but I found myself rewatching it over and over again. As a Filipino American, I never saw a ton of representation (if any) on film, television and comics. So I GRASPED tightly to stuff that did represent us, and represent us in a fashion that I can relate to. I didn’t get around to finally seeing it till years later. I was working a booth at the Festival of the Philippine Arts & Culture (FPAC for short) and I saw the DVD on sale. I bought it and watched it that night. It took me a while to get use to funky style of it all. The film was clearly slickly edited, but the acting and camera work was rough, but yet, I found a fun charm to the whole thing. It SHOULD have been an unwatchable mess, but instead it saw the years of passion put into it, and the dedication to finishing it made me start appreciating and liking it. See, it took them 7 years to finish the movie, so that means the cast members ages fluctuate throughout the film. At one point they are in their mid-to-late teens, in another shot they are in their early twenties. Hair is long in one shot, it’s shorter in another shot. Characters have braces, then the next scene they don’t have them anymore. It would have been annoyingly bad, but due to the great pacing, and the light fun tone, and the knowledge that it’s a homemade movie, it actually adds to charm and the fun factor. It actually reminded me of the story of the kids who remade the Raiders of the Lost Ark. Both of these groups had the the same goal, and kept making these low budget films because of their discovered love of filmmaking. Damn continuity, they just wanted to finish. On top of that, the characters in LUMPIA were actually really well defined, the story was surprisingly effective, and actually had a deeper message. Pat eventually got around to making some pretty cool music videos, including working with the Black Eye Peas. Some time later I finally met Pat at The Los Angeles Asian Pacific Film Festival. He seemed like a cool guy, we exchanged info, and I figure I’d see him around at the same events. What I didn’t know at the time was that Pat was as big of a fanboy as me. He attends all the same Cons, watches the same movies, buys all the cool toys, and he’s got the same drive to tell a certain kind of story that he wants to see. A year after that I met his editor/producer A.J. Calomay. I was helping out a short film production, doing tasks here and there, but most of the time I helped A.J. log and capture footage. Again, A.J. seemed like a really cool guy, and I figured I’d see him once in a while. Soon, I started seeing more of their stuff, and the one thing I couldn’t help notice was that their strong sense of story and character. These were the elements that was the strongest in the first LUMPIA, and those elements always stayed as the focus of their work. Some of my favorite work of theirs was the short simple narratives that they made for contest, like this one they did for a DirectTV contest. I saw how much, and how hungry, Pat and A.J. wanted to tell full narrative stories. It’s why I wanted to get involved in helping out in the making of LUMPIA 2. I knew that they grew as filmmakers, and there is something cool about doing a sequel to a film like the first LUMPIA. Taking those characters and make a film that could be fun and a great way to showcase how much better you’ve gotten. As a film fan, I LOVE that stuff. Part of the way they are promoting the Kickstarter is doing these fun video interviews on Youtube, talking to Filipino creators. They’ve interviewed Dante Basco (RUFIOOOOOO(!) from HOOK and the voice of Zuko from Avatar: The Last Airbender!) for the first part. Recently, I joined Pat to interview famed Filipino Comic book artist Whilce Portacio (Drew X-Men, co-created Bishop with Jim Lee, help start IMAGE COMICS, created Wetworks etc. ), which you can see below! So, as of this time of me writing this post, they have 24 Hours left. If you feel like you can help make this happen, donate whatever you can. Because they are not just promising a FILIPINO AMERICAN film, they are promising a totally fun, funny and entertaining film that everyone can enjoy. Like most Filipino parties,the more the merrier! So, click the link below, and if you so wish, help BACK THAT LUMPIA! UPDATED:The trailer to one of the riskiest indie films ever made, “Escape from Tomorrow” is now up.